A Thames Barrier-style tidal defence is being considered in Bristol to prevent future flooding. 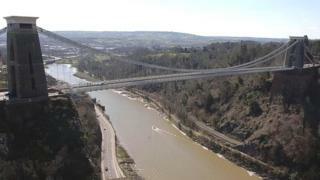 About 1,000 properties in the city are currently at risk from a tidal surge, according to Bristol City Council. In a bid to reduce the flood risk over the next 100 years, the council has revealed its barrier idea. Patrick Goodey, from the council, said: "It would be completely open for the majority of the time and we could close this in advance of a high tide." The Thames Barrier is made up of 10 steel gates across the River Thames which, when open, lie flat on the river bed and close by being rotated upwards, blocking the river. At an annual scrutiny committee meeting, Mr Goodey said Bristol had reduced its flood risk to about 220 homes since the launch of its flood management strategy in 2014. "If we did have this event, we would have about 1,000 homes and businesses flooded throughout the city," he said. "A significant high tide of this event would be over nine metres. The level of the harbour is six metres. "In this event, the river would flood over into the harbour, fill up the harbour and then flood out from there." In July 1968, low-lying parts of the city were flooded following freak thunderstorms. Since then, Mr Goodey said the city had installed "significant infrastructure" and was also considering barriers and fences. "We've got a number of tunnels throughout the city that now divert flood water, so if we had a 1968 event, the flooding would not be as bad as it was back then," he said. "We could also do a combination of riverfront defences plus a barrier, depending on how climate change is progressing. "Those are the two options we're moving forward with and exploring at the moment." Could an Avon barrier protect Bristol from storm tides?